LinkedIn provides its greatest value as a social media network when grounded in the real world. 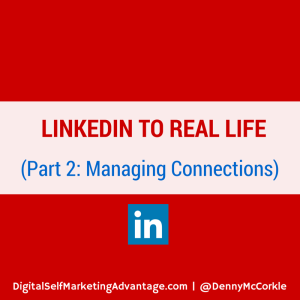 The concept of networking convergence and making physical networking connections using LinkedIn was shared in a previous post, LinkedIn to Real Life (Part 1: Making Connections). This blog post explains how-to better organize and manage your LinkedIn connections to maximize your opportunities for networking convergence. When attempting to connect on LinkedIn with any of the of your chosen connection strategies (such as: friends & family referrals; alumni networking; or local career focused groups), you need to write a personal invitation noting your relationship with them (such as: work colleague; attended same University; member in same LinkedIn group; or have done business with) and a specific request and reason to connect. Note: in some cases beyond a mutually shared work or education experience, LinkedIn may require that you demonstrate a prior connection and ask for their work email address (LinkedIn>Connect>How do you know…Other). Otherwise, you can always use LinkedIn’s “Get Introduced” or “Send InMail” options. Regardless of how you connect, you should always write a personalized invitation and never use the “lazy and ineffective” default invitation unless you are trying to connect with someone who already knows you well. When a connection is accepted, it is important for you to visit the new connection’s LinkedIn profile and go to the Relationship section to: (1) note how you met or why you connected, and (2) tag them into predefined groups of your design (such as: friends and family; work colleagues and supervisors; school classmates and professors; members of local XYZ club; employees at XYZ company; people I may meet during a job interview with XYZ company; current or potential clients). Note: a connection can have multiple tags. 3. Thank Your New Connections. While there in a new connection’s profile, a nice added touch is to send a short message: (1) thanking them for connecting, (2) reminding them of your career focus and the related content you will social share on LinkedIn, and (3) the hope or desire to someday meet them in person. 4. Pre-Networking Preparation for Real Life Connecting. The use of LinkedIn tags is especially important for your preparation to attend and network at a local meeting. Prior to attending a local meeting or opportunity for physical networking, you can review the appropriately tagged group and each group member’s profile, photo, social activity, and recent announcements. Identify those you would most like to meet physically and make some notes from their profile (the note taking will also help you to remember). They will receive a notification that you have recently viewed their profile and may reciprocate by viewing your profile. This will make you and your personal brand more memorable and increase the likelihood of recognizing each other at the networking event. In some cases, you may want to send a private LinkedIn message to tell an important contact that you are attending a particular networking event and you will look for them (or request to meet them face-to-face). These pre-networking preparations are important so you can more easily recognize your LinkedIn connections in real life. Also, when you physically meet them you will have some good conversation starters and questions for a more meaningful physical networking experience. Advanced Tip: The LinkedIn mobile app is also recommended to assist you in supporting your memory and notes. 5. Follow-Up with Your New Connections. After meeting with a LinkedIn connection in real life for the first time, you should send them a short LinkedIn message that thanks and reminds them of that physical meeting. While an email may accomplish the same, a LinkedIn message will increase the likelihood of their clicking through to your LinkedIn profile and thus reinforcing your personal brand. Get Noticed & Remembered by Your LinkedIn Connections. Remember, your LinkedIn status updates/announcements and social activities (social shares, likes, and comments; with groups, too) will show up in the Network Updates stream of your connections. It is important that you regularly social share career-related content to keep your name and LinkedIn profile “top of mind” with your connections. Just one good social share a day is enough of a reminder of your existence and your career focus/interest. Do not be a link dropper. Instead you should always add comment or social share annotation so as to share a bit of your thinking and encourage interaction or engagement. You can also social share content to a career-related LinkedIn Group for which you are a member, and this activity will show as a Network Update to all your connections. However, you should never share duplicate content across multiple groups for this could overwhelm your connections’ Network Update stream with duplicate content and label you as a possible spammer. It is also best that you read the rules or expectations for sharing or participating in a particular group so as not to get banned or restricted from that group or from all groups (SWAM – Site Wide Automatic Moderation). Advanced Tip: It is also beneficial for you to participate in your targeted groups and regularly “like” and make meaningful comments. Your comments will show as Network Updates to all your connections, and as a Notification to others who have left comments on that same post. Thus, if you add your comment on a popular group discussion, others who are not a current connection to you will be notified of your meaningful contribution to the group discussion. Additionally, when an update or announcement (such as: job anniversary; new job; accomplishment; birthday) is shared by an important career stakeholder connection, you should press the “like” or leave a friendly comment. You can find all recent announcements from your connections by going to LinkedIn>Connections>Keep in Touch. You should visit this Keep in Touch button at least once a week so as not to miss recognition by an important career connection. Advanced Tip: The LinkedIn Connected mobile app makes it easier to manage your efforts to congratulate your most career relevant connections. Use the @Mention function when you want to make sure that a particular person sees your social share or comment. In the comment box, just add the @ symbol in front of the targeted connections name and they will receive a notification that you have included them in your social share or comment. You should also practice what Jay Baer calls Youtility and Mark Schaefer calls Authentic Helpfulness. You should take notice in your Network Updates stream or in a group posting when an important connection has shared something, liked something, commented about something, or asked a question. Then participate or engage with them. Add something relevant to the conversation. Try to offer or suggest related content. Voice your opinion. Or, in other words: be genuinely helpful. You should also announce to your connections as a Network Update that you will attend a particular upcoming career-related physical networking event (such as: local meeting; conference; charitable event). This will increase the chances that a connection will recognize your name badge and/or a familiar LinkedIn face at the local networking event. And, this announcement will also confirm to others (such as: current and potential employers; career stakeholders; social recruiters; and current and potential clients) that you are professionally active and learning for your career advancement. Upgrade Your Tools for Networking Convergence. Make sure the web link to your LinkedIn public profile is easily found on your business card, email signature, and resume. Your LinkedIn public profile link is found at Profile>Edit Profile and under your profile photo. You should edit or customize your LinkedIn public profile link to end with your personal name instead of the default letters and/or numbers. You should use an email address that includes your full name as used in your profile (for example: DennyMcCorkle@gmail.com), and include this email address on your business card, email signature, and resume. Advanced Tip: If you want to make it easier for others to connect with you after visiting your LinkedIn public profile, then you should include your email address in your LinkedIn public profile Summary as a call to action (CTA). For example, I recently added this statement to the end of my LinkedIn Profile Summary: Contact or request to connect with me using: DennyMcCorkle@gmail.com. This is necessary because many potential connections without a common Education or Experience with you will need your email address to connect with you on LinkedIn and the Contact Info section of your profile is only visible to current connections. Regardless of your digital prowess, if you find yourself in any professional situation or event where you may introduce yourself with a handshake, then you need a printed business card to leave as a take-away. While some employers may have strict graphical or design requirements for a company business card, at a minimum your business card should have a link to your LinkedIn public profile. Though some professions may disagree, if possible I recommend that you consider adding your LinkedIn photo and headline/tagline to your business card. This will add to the continuity of your personal brand identity/message and the networking convergence between your physical networking and your social media networking. However, I would not add a photo to your resume. Alternatively, when sending out printed resumes, you could attach your LinkedIn influenced business card. This will help your job application to stand out and more strongly encourage a review of your LinkedIn profile and social share activity. Now, whenever you meet someone in real life through physical networking, exchange business cards with them, and write the meeting place, time, and details of the conversation on the back of the card. Later and at a more convenient time, you can write a personalized invitation to connect with them on LinkedIn. And, once connected you can add this information about the initial meeting to the Relationship section while on their profile page. One last recommended tool for connecting your LinkedIn to a real and physical life is the use of name badges/tags when attending a networking meeting or event. On your name badge, you should add your LinkedIn name and your LinkedIn email address to encourage others to search for you and connect (for example: LinkedIn: DennyMcCorkle@gmail.com). LinkedIn is the go-to social media when digital networking for personal branding, job search, and career advancement. However, if your social media networking efforts are not converged or grounded in the real or physical networking world, LinkedIn’s greatest and most direct benefits are missed. What are your creative ideas for managing your LinkedIn connections for increased networking convergence? This article originally appeared on Digital Self Marketing Advantage, and has been republished with permission.